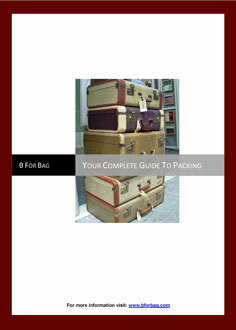 B for Bag offers free Vacation Packing Guide that you can download and print for your convenience. Our travel packing guide includes practical travel packing tips and advice on packing, like what to pack and how best to pack it, as well as packing list templates for different occasions. Packing for a trip should be fun but many people dread packing their luggage and find the whole experience stressful. This is usually because they are not sure about what to pack. They are worried they will forget something but at the same time worried that they are packing too much. B for Bag suitcase packing tips offers advice on what to pack, i.e. which clothes, toiletries and gadgets to bring and what to leave behind. B for Bag also includes advice on packing your bag, i.e. how to pack. We know that packing a bag is all about the best use of a limited space, to fill all space as efficiently as possible. We explain the most popular luggage packing methods in details (with photos) but they are the folding, rolling, and bundle wrapping packing techniques. B for Bag vacation packing guide also includes 10 vacation packing list templates, suitable for different occasions. There is general packing checklist suitable for most adults on most trips as well as number of packing list for children of different ages. Then there are vacation packing list for business travelers and for people going on cruises and skiing trips. There is even special packing checklist for people with diabetes. How To Download Our Free Travel Packing Guide? Just click the download button to get our FREE B for Bag Vacation Packing Guide. We offer owners of websites and webmasters to make our travel packing guide available to their readers free of charge. All we ask in return is an acknowledgement from you for our work in putting the guide together. To download, click on the image below or the relevant link. The guide will open Adobe Reader in a separate window where you can save it to your computer. B for Bag travel packing guide includes all the packing list templates as well as the general suitcase packing tips. It is 20 pages and contains 10 separate packing lists.